The company Deutscher Wetterdienst uses altogether 16 weather radar units in Germany. The picture shows the site “Neuheilenbach” in the mountains “Vulkaneifel”. 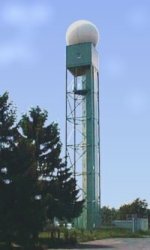 The tower has altogether a height of almost 37 m. The radome has a diameter of 6.7 m and contains a 4.2 m parabolic antenna. The maintenance room is located under the radom. It contains all technical facilities which are necessary for the operation of the radar. 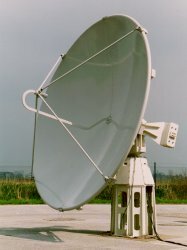 The doppler pulse radar Meteor 360 AC of the German manufacturer Gematronik in Neuss works with G-Band frequencies (5.6 GHz former so called S-Band). The magnetron generates a peak power of 250 kW at a pulse width of 2.0 or 0.8 µs and uses the pulse repetition frequencies (PRF) 250 and 600 Hz or a dual PRF of 800/1200 Hz. 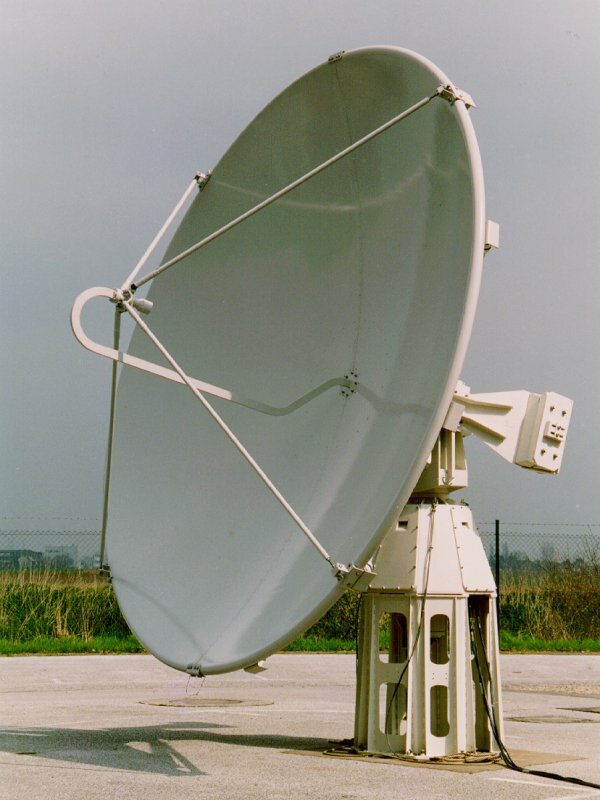 The antenna turns with a period of 3 rpm and has an antenna aperture angle of nearly 1° The measured raw data contains a volume- scan every 15 minutes and contains percipitations in a radius of 100 or 250 km of the location every 5 minutes. The raw data are processed and published centrally in Offenbach at the Main- river. Also there happens the very important comparison of the radar data with the data of the percipitation ground measuring net. Because: not everything which falls out from the clouds arrives also on the ground.